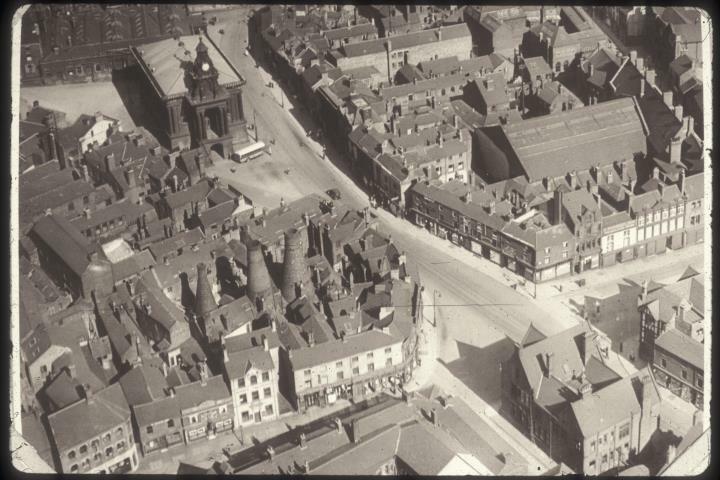 Description:The aerial photograph was taken in 1927 and shows Market Place running up the middle with the town Hall on its left. 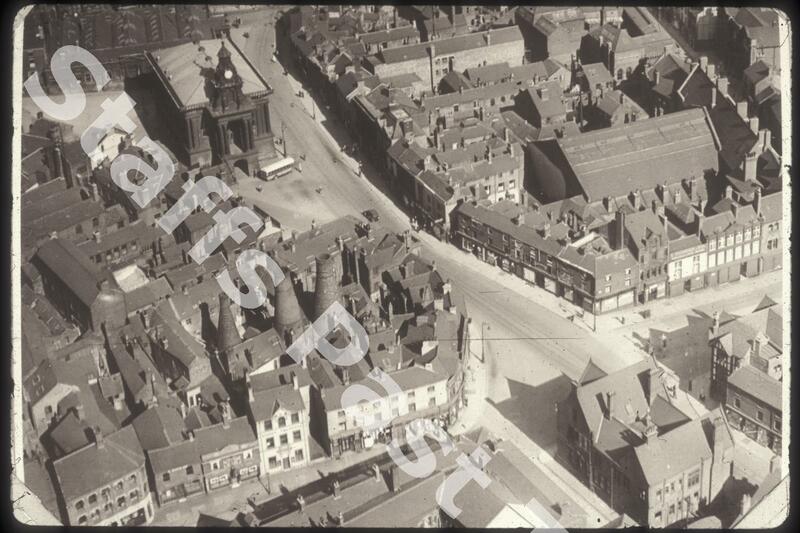 In the bottom left hand corner is Fountain Place with St John's Square off to the right. Westport Road (formerly Liverpool Road) goes off to the bottom left. Judging by the lack of traffic and people, the photograph was probably taken on a Sunday. Above the Town Hall building is the old meat market (The Shambles area). This covered market was demolished in 1957 and stood on the site of Wedgwood's first works (Ivy House). Later the site of Ceramica, it became a garden. The row of three bottle ovens in the bottom half of the photograph belonged to the Central Pottery. This was an earthenware pottery operated latterly by Wilkinson's. At one time the works was home to Burgess & Leigh who operated the Middleport Pottery. The pottery has been demolished. Along Westport Road, the white, three storey building is Queen's Chambers. In the bottom right hand corner is the black & white "Duke William" public house and opposite, on the other side of Newcastle Street is the former Manchester & Liverpool District Bank building. The large building with the ridge roof on the right hand side is the indoor market, connected to Market Place by Market Passage. In the top right hand corner is the Burslem School of Art building on Queen Street and opposite, the Wedgwood Institute, just above the market hall.